Mafia II puts you in the role of Vito Scaletta, a Sicilian-born immigrant who spent his formative years on the tough streets of Depression Era Empire City (Mafia II's stand-in for New York City). Busted while committing a petty crime with his best friend Joe, Vito opts for military service in lieu of jail time. He soon finds himself back in the old country as part of the US invasion of Sicily where he is wounded in combat. On leave back in Empire City he meets up with Joe and finds that his friend has started to make connections with the mafia. Joe's new found friends secure discharge papers for Vito, and there begins his new life working for the Families of Empire City. 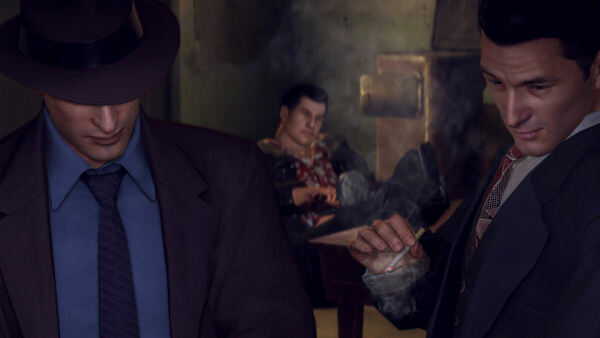 Mafia II's Empire City is impressively detailed and it's obvious that great lengths were taken to try to recapture the mid-1940s and, later in the game, the early 1950s. Cars, fashion, billboards, and music all reflect the eras in the game with an attention to detail that only lets an occasional anachronism through, such as a phrase spoken by a character that's decades ahead of its time or a song that comes blaring through your car radio five years before it was released. Empire City is a pretty complete city, from financial districts to working class neighborhoods and ethnic enclaves, from mansions in the hills down to warehouses and junkyards by the docks and riverfront. Time of day and weather effects further bring the city to life, and you'll experience everything from an evening's snowfall to a wet spring morning to a bright and sunny day. Empire City is of the living, breathing variety, with plenty of traffic of both the foot and vehicular kind. Unlike most living, breathing cities in games these days, though, there's not much to do in Empire City outside of the game's story missions. You can take your time getting to the next mission location in most cases, striking out into the city to roam its streets. But there are no side missions, turf wars, or anything else to encourage you to spend additional time in Empire City beyond that required by the story missions. You can steal some cars and sell them off to a couple of chop shops, but there's not much to spend your money on once you do. There are some clothing shops but their selection is extremely limited and the same stock is shared by all locations. There are some gun shops as well, but you always go into a mission armed and it's easy enough to pick up plenty of weapons and ammo off of fallen enemies. The more time you spend in Empire City, the more you realize that it's less a living, breathing city and more of an empty backdrop for the game's storyline. The storyline itself follows pretty familiar terrain for mob stories, complete with hits, broken alliances, and double-crosses. It's not exactly Scorsese material, but it's a bit above average for videogame fare. The story drives the game's missions to the point where you will go through some long stretches without doing much in the way of actually playing the game. The game tries to break up these stretches with mundane interactive tasks such as scrubbing a urinal or searching for an item or alternate entry that is literally in the next room, but these just seem to emphasize the fact that the game isn't letting you play it nearly as much as you wish it would. You'll also spend a healthy slice of your time with the game behind the wheel. The game has you doing a lot of driving simply to get from Point A on one side of the city to Point B on another, too often to merely trigger a cutscene for you to watch before getting back in your car and driving to your next destination.